On the Anacostia River, a short distance downstream from Bladensburg stood the Native American trading center of the Anacostan Indians then called Nacotchtank or "at the trading town". In the 1660s, Europeans settled the banks of the Anacostia River and the Maryland government set up reservations to protect the Indians from European encroachment. Although there is no "Indian town" shown on the Anacostia River on a 1670 map, individual Indian households appear to have seasonally occupied the river banks in the late 1690s. Late 19th century antiquarians were able to make important observations about the Nacotchtank and Bladensburg areas prior to urbanization. They noted a succession of archaeology sites at short intervals, apparently corresponding to small groups of households, extending from Giesboro Point on the Potomac River nearly all the way to Bladensburg. 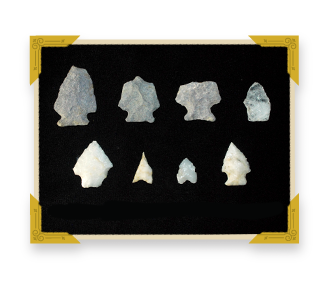 Concentrations of broken pottery, stone tools, and ceremonial items from the Anacostan occupations usually corresponded to small stream confluences with the Anacostia River. When runways for Bolling Air Force Base were built in the 1930s, at least two ossuary burials were found during construction. A pottery type known to modern archeologists as Potomac Creek is found on Piscataway and Anacostan sites as well as sites in Bladensburg. The Anacostans do not survive as a modern Native American tribe; however, three communities of Piscataway Indians exist in southern Maryland today and descendants of the Anacostans are likely found among them.